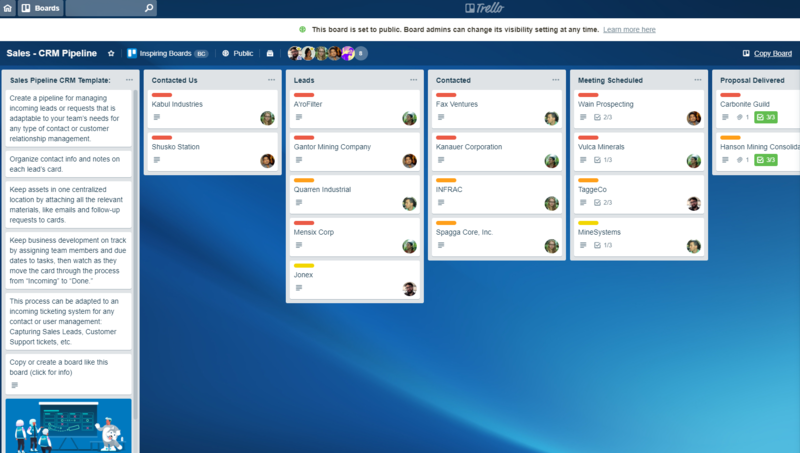 Trello is primarily a project management software, but it can be easily customized for basic CRM functionality using its kanban interface, custom fields, calendar, and Google Drive integrations. Trello allows businesses with simple sales processes a way to save money and manage both projects and prospects in one place. However, there are also affordable CRM software designed for small businesses that integrate directly with Trello and provide better contact management capability. Pipedrive, for example, includes the same drag-and-drop-style interface as Trello does, but also comes with better built-in CRM functionality. You can try it out for yourself by using their risk-free, 14-day trial. Setting up Trello as a CRM first requires understanding your basic sales process—the steps it takes to move someone from a contact to a customer for each of your products and/or services. This will define how you set up your sales pipeline and deal stages. Later, you’ll add your contacts, create pipelines and stages, set up teams, and invite users. If you have multiple sales and support users, be sure to include them in the process from the start. Write down the sequential steps in your sales process. These are the activities it takes to move someone from contact to customer. If you have multiple products and services with different steps in the process, create a pipeline or “Trello board” for each. A pipeline is a visual snapshot of your deals with the associated stages. 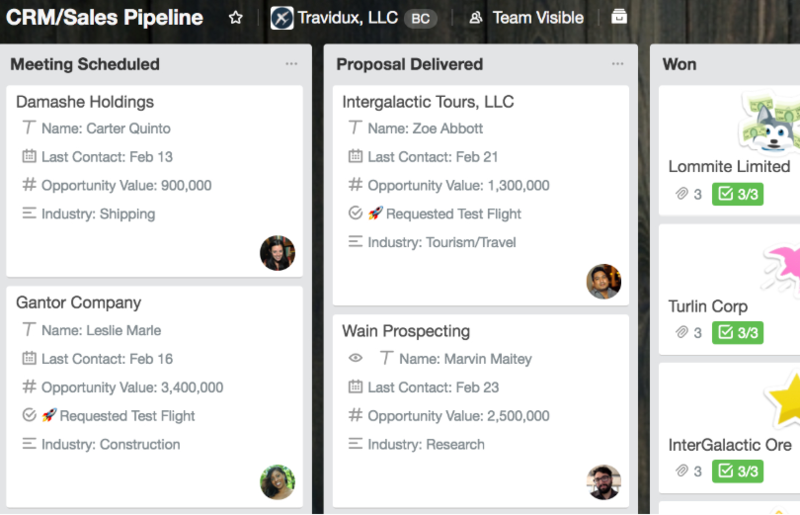 What many CRMs call pipelines, stages, deals, and contacts, Trello refers to as boards, lists, and cards. This is displayed in the interface in kanban format with drag-and-drop functionality. 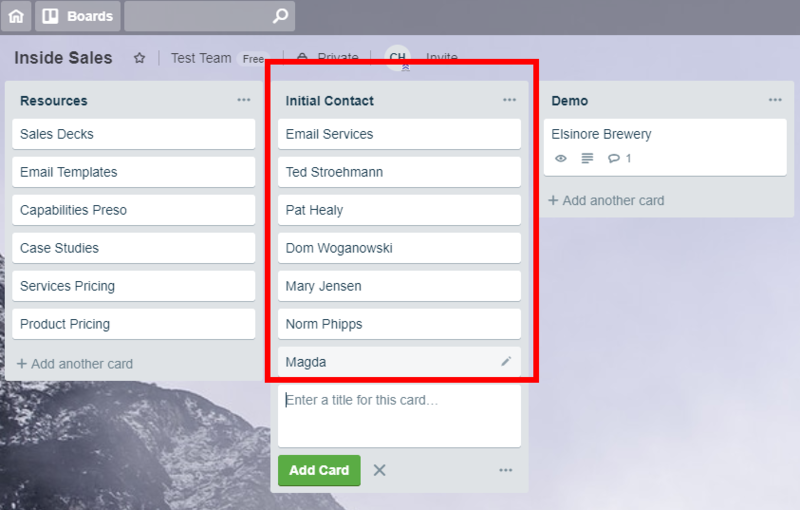 To complete this step, create a board (pipeline), then add your lists (stages), and in any list or stage, you can add cards that serve as a contact’s information (company name, contact name). 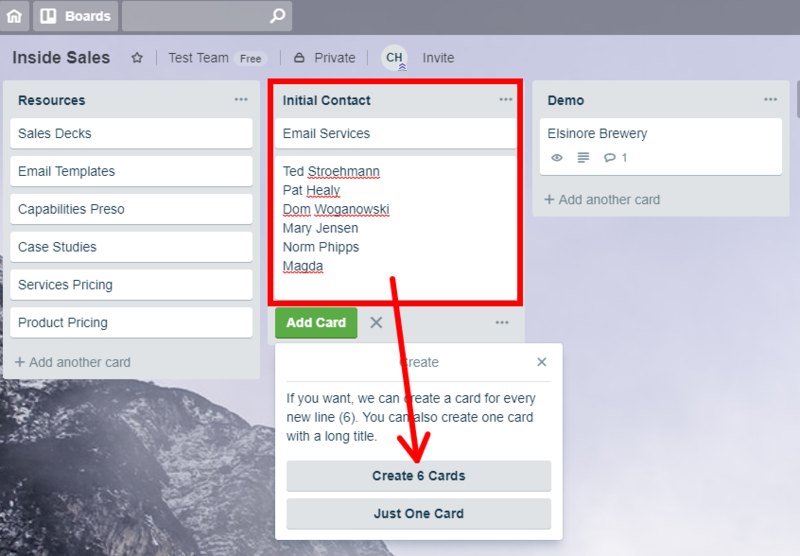 Contacts and companies are represented as a card using Trello as a CRM. You can manually add them or, better yet, use third-party app Zapier to transfer contact information from Google Sheets, Evernote, Typeform, and Gmail, which will create new contact cards. In addition, you can use a company like Import2 to easily import CSV files into Trello. Basic card for a company. You can manage contacts or companies using Trello cards, but try to pick one and stick with it for consistency. We’ll use a company card as an example to show the important features to consider when using Trello as your CRM. Card Title: Add the company name. Description: Add contact name and details such as email, phone, address, a brief description of how you connected with them, and any other high-level details that matter. Comments: This is where you should keep notes of conversations, add attachments, and copy team members to notify them when necessary. Members: Invite relevant team members to the card for collaboration. Labels: These are color-coded ways to categorize leads for things such as lead source, urgency, or what they’re interested in. Checklist: Create a to-do list of items that need to be completed during the sales process, such ask for a business plan, schedule a demo, do competitive research, and so on. Due Date: Add reminders for important tasks. You’ll be notified by email 24 hours before the task is due. The calendar Power-Up will give you a view of all of your tasks by week and month. Share: Send a link to your card to multiple teammates. Watch: Clicking this feature will notify you when someone makes a change to the card. Custom Fields: See the above section on Power-Ups for details and use cases. Teams are groupings of boards and people, and can include admins and regular team members with no limits to the number of teams or members per team. Creating teams is useful if you have multiple departments. For example, if you have inside and outside sales teams, you may want to create separate teams with different pipelines. Invite as many people to a team or board as you need. You can do this at the team, board, or card level. There’s also an option to make a board private by board members, available to team members, and public, which makes it available (view only) to anyone who finds it on the internet. Here’s an example of a public Trello board. Download the mobile app to work wherever you are. 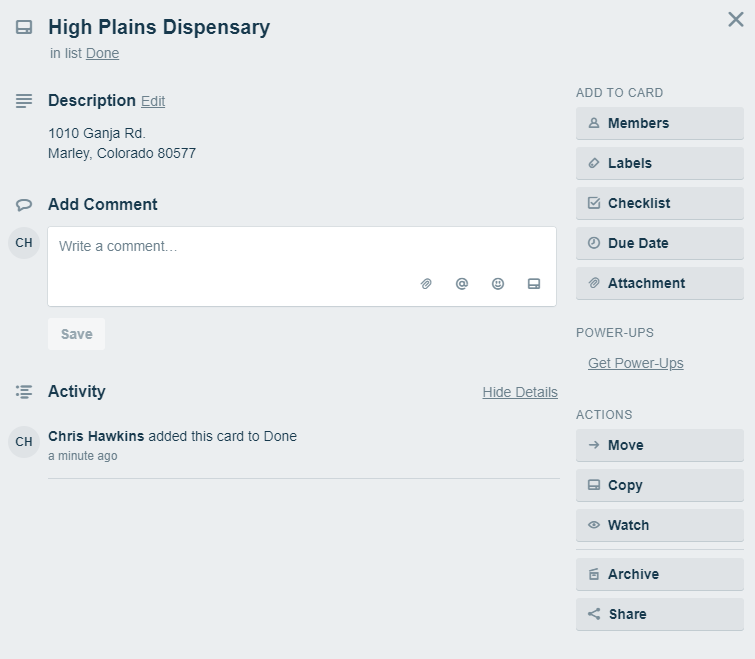 Here are some of the things you can do on the go: create boards, rearrange workflows, assign cards to members, add card details, and add pictures to cards. Even if you’re offline, all changes you make will be synced once you’re connected again. Along with internal customization options, Trello provides dozens of integrations with third-party apps for sales, marketing, project management, HR, analytics, and more. Trello collectively calls these Power-Ups. The free version allows only one integration, but the two paid plans ($9.99 per user per month and $20.83 per user per month) allow unlimited power-ups. Integrations with third-party software pull data and information from these apps and require a separate login and, in some cases, a paid subscription. The functionality of these integrations with Trello will vary by app. The calendar power-up lets you easily manage weekly and monthly cards by dragging and dropping them to the calendar to automatically update due dates. You can also filter cards by due dates, see completed tasks, and export the calendar to third-party apps. The calendar is also supported in the mobile app. 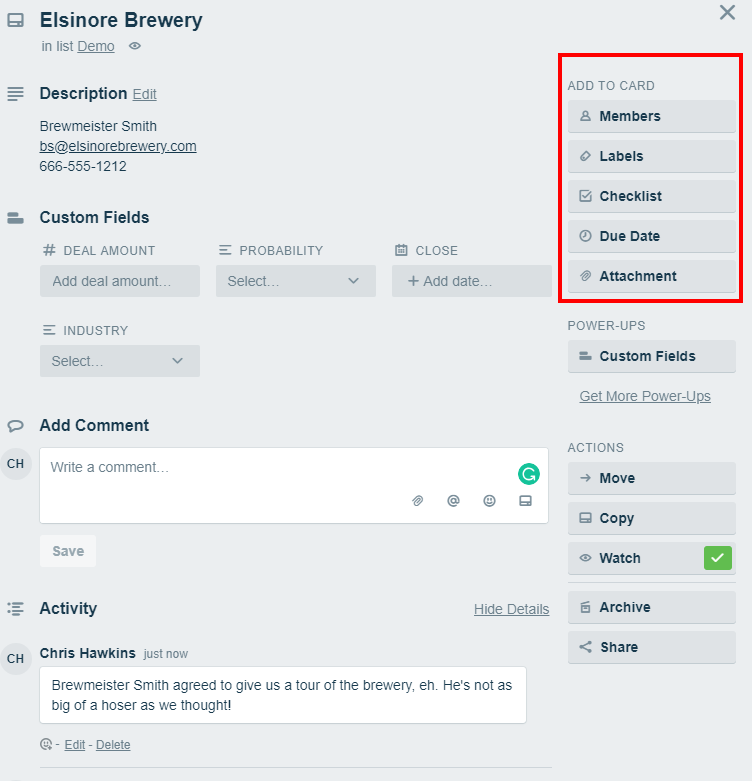 To use Trello as a CRM, you’ll likely want to add the custom fields power-up, which lets you add data fields and other CRM-related functionality to cards. Once added and populated, the fields will appear within each card and on the card within the board for a quick view of multiple deal details. Checkbox: Create tasks associated with moving a prospect through the sales process, such as sent capabilities deck, create demo account, sent case studies, met stakeholders, and so on. These will serve as reminders for the actions usually associated with closing a deal. Date: Set time and date reminders for tasks, estimated closing dates, contact dates, campaign dates, and whatever else is important in the sales process. Add multiple calendars to one card. Drop-down: Use a drop-down menu to create options for important items such as industry, SKUs, types of product/service, and win probability. Number: Use for deal size, account number, order number, or any other significant numerical value. Text: Add contact name, company, location, and other important deal identifiers. Example of a basic sales pipeline set up with Trello. The integration with Google Drive gives you additional flexibility and saves time as the link is included in each card for easy access. You can search and attach files with a few clicks. You’ll also see real-time previews for Google Drive files attached to cards. As there are limits to the attachment size in each of the plans (10 MB and 250 MB), this is a way to easily connect larger files such as presentations and proposals for quick retrieval. There are dozens of other Power-Up options such as Slack, SurveyMonkey, Twitter, and Wistia, all with varying degrees of functionality once connected. With Twitter, for example, you can attach tweets to cards. You can share information by sending Trello cards to Slack channels or individuals and attach those conversations to cards. 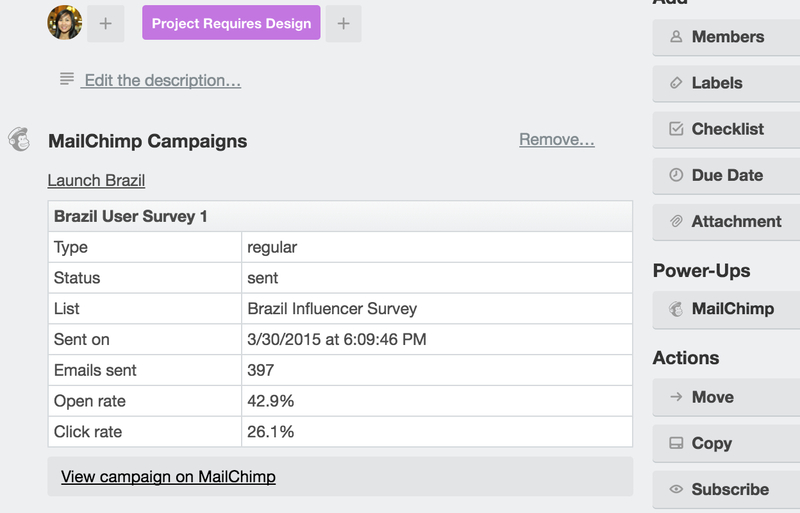 When integrated with Mailchimp, you can add templates and campaigns to cards, and see campaign data within those cards. While researching this article, I discovered another Power-Up called Butler, which is supposed to automate many of the tasks in boards and cards (Trello, in fact, acquired Butler in December 2018). Because I wasn’t already a Butler/Trello user, I was not able to test it during the transition, but evidently, it will be available again soon. In the meantime, the article How to Use Butler will give you an idea of the software’s capabilities when combined. The simplicity of the Trello CRM makes it easy to manage your sales pipeline(s). Contacts can be added using a number of third-party forms (Power-Ups) and customized with various data fields to provide the context you’ll need as you move them through the sales funnel. This is done by simply dragging and dropping a contact/company from one to stage to the next within the pipeline. To add new contacts automatically, you can use third-party app Zapier to connect your website forms to Trello, sending form information right into your board. You can use this connection with Google Forms, JotForm, TypeForm, and other supported tools. 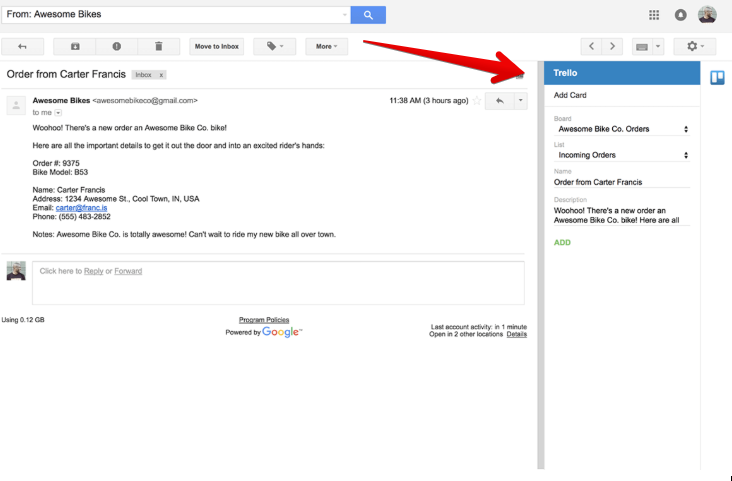 In addition, the Gmail add-on lets you add contact cards to Trello from your inbox with one click. Subject lines become cards titles and email bodies are added as card descriptions. You’ll want to change these to either the company or contact name—whichever system you’ve decided beforehand. If you need to move a deal to another pipeline, click the context menu in the top right of the deal (or card) and select “Move.” This will pull up a list of the pipelines and deal stages that you can pick to move the deal to. You can also move the card while you’re in it by clicking on “Move” in the bottom right corner and following the same steps. Use the first list as a place to store resources, such as case studies, pricing decks, capabilities, email templates, marketing collateral, and other often-referenced items. This makes it easy to attach and send right from your board. Resource list set up in Trello. 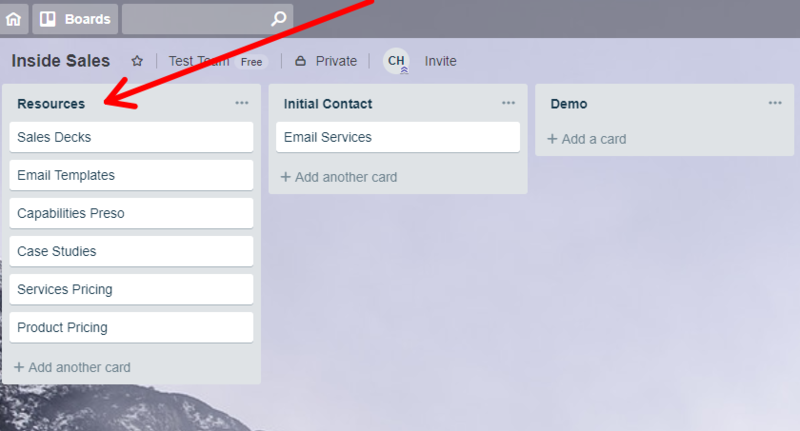 To become a power Trello CRM user, you’ll need to learn all the advanced features, shortcuts, and actions that will save you time and improve your overall efficiency. These are things like drag-and-drop capabilities, keyboard shortcuts, and mentions. To alert a teammate to an item in a card’s comments, type “@” followed by the first few letters of their name, and it will auto-populate their name. That person will receive an email notification with a link to the card. They must be a member of the board to get the notification. From your desktop, you can drag and drop multiple files to a card to upload them. In addition, you can drag images from other sites to cards. Keep in mind there’s a 10 MB attachment limit for the free plan and 250 MB limit for the business and gold plans. To simplify the process of creating multiple cards (contacts or companies) at once, you can copy a spreadsheet column or line-separated list from a document, paste it into the card, and click on submit. It will then create a new card for each line in the list. In the below example, I copied names from a Google Sheet and pasted them into a card, instantly creating six separate contact records. Creating multiple cards in Trello. 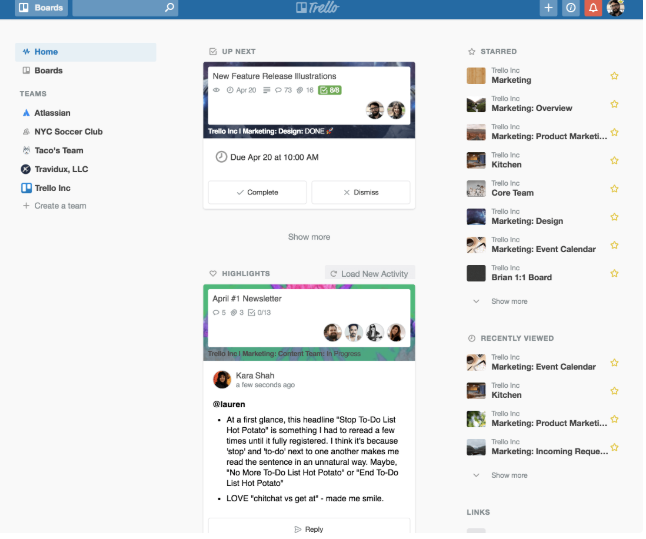 The Trello home view provides the 30,000-foot view of what’s happening with teams, boards, and cards. “Up next” shows cards that have upcoming due dates, those recently overdue, and active conversations that require your reply. “Team highlights” show all conversations from your boards so you can stay updated. You can go to any card in the home view by clicking on its title. There are currently no native reporting tools in the Trello CRM. However, there are a few ways to get insights into how you’re using the platform with Power-Ups. By using a time tracker such as TimeCamp, you’ll know how long you’re spending on each contact or deal. The Card Aging app will show cards in various visual states (e.g., fading out, looking aged) depending on the last time they were touched. There’s also a Chrome extension called Original Card Counter that shows the number of cards in every list. This is a small but helpful function that can provide an at-a-glance count of the number of deals you or your team have working. There are many sales-related options for how to use Trello besides strictly managing a pipeline. You can create a centralized resource for your sales team, onboard customers and employees, and collaborate with customers on topics that are important to them and your business. Then create separate cards for specific items within those task sections. If you’re already using Google Drive or Dropbox, it’s easy to add links within each card for those resources. Boards for onboarding customers and employees can be set up similar to a sales pipeline with different stages and steps within each stage as part of an overall linear process, e.g., 60-day training/onboarding for a new salesperson and a two-week customer onboarding process. All applicable team members will have access to the boards and always know what’s going on. One way to increase customer satisfaction and reduce churn is to create a board for product feedback. For example, create a board for feature requests where you show features you’re currently working on and invite customers to request their own. The board can be made public, comments can be collected, and customers can provide feedback on early releases or ideas. If you like Trello’s ease of use and kanban-style user interface, but want more sales-related features such as email integration, reporting, and dashboards, consider these CRM options: Freshsales and Pipedrive. Freshsales has the same drag-and-drop pipeline management as Trello, plus lots of customization options for contacts, deals, pipelines, and sales activities. There’s also email integration, email marketing, lead scoring, and built-in reporting. And with the Freshworks family of applications, there are plenty of business add-on options such as live chat, customer support, and IT service management software. Visit Freshsales for a free, 30-day trial. Pipedrive has an intuitive interface with drag-and-drop functionality combined with Gmail sync, multiple dashboards, and the ability to track personal, team, and company goals. Integration with over 100 third-party apps allows businesses to continue to grow while still using the CRM. For a free trial, visit Pipedrive. It may not be a full-featured CRM, but setting up and using Trello CRM is easy once you’ve outlined your sales process. From there, you can create multiple pipelines and easily add both new and existing clients with custom fields. The capabilities aren’t limited to just the CRM, as you can also create boards for onboarding, for customer collaboration, and as a sales resource. However, if you are looking for a more full-featured CRM with an affordable price point, consider Pipedrive. Pipedrive offers the same easy to use, drag-and-drop-style interface, but offers fuller reporting functionality as well as the ability to manage product pricing from within the tool. Best of all, Pipedrive comes with a built-in Trello integration, giving you the best of both worlds. You can sign up today to get started with a risk-free, 14-day trial by visiting their website.